Huge Announcement: I’m turning Pro! After months of planning and preparation, numerous high dollar donations to governing bodies, and in depth negotiations with my sponsors and family, I’ve decided that – and am very proud to announce – that I am changing careers and becoming a professional triathlete, effective immediately. Mrs. Tri Madness and I have recently sold our house here in Florida, and will be moving into a slightly used, 1968 VW bus camper van. We will be home schooling our children while we travel the country to participate in races. I have struck an agreement with Wal Mart which will allow us to live and stay rent-free in the parking lots of thousands of Wal-Marts across North America. I will be competing in 100 events over the remainder of this season, culminating in my entry into both Kona this October and the Rev3 series championship in May 2015. Both WTC and Rev3 have agreed to create a special professional category to reflect my unique abilities and skills. Team TriMadness is very excited to further announce that as part of our sponsorship agreements with PowerBar, the TriMadness family will exclusively consume PowerBar product for the totality of our nutrition needs. In order to hone my triathlon-related skills, Team TriMadness has entered into coaching agreements with a variety of world-class athletes: I will be partnering with Ryan Lochte for swim coaching, Miguel Indurain relative to cycling, and Meb Keflezighi for running. Additionally, I will be partnering with renowned physician Michele Ferrari to ensure that I am able to optimize my nutrition and physical capabilities. I’m excited to launch into this new phase of my athletic career. Please follow along as I expand my social media presence beyond this blog and Twitter. As part of a new strategic relationship I have established with Google and Netflix, I will begin hosting a weekly broadcast and update of my race performance and life on the road as a professional triathlete. Today I did something really great. I went to a funeral. Now, I know those two sentences don’t normally go together, so I’d like to explain a little. You know how they say that funerals aren’t supposed to be about mourning, but instead about celebrating life? Well, it never seems that funerals actually end up being that way – at least for me. Every funeral I’ve ever attended…at least those that I can remember…were decidedly not celebrations. Twenty years ago, when my mother passed, I was devastated. Her funeral was a sob-fest for me. I was heartbroken. I grieved as a son should, I suppose. Fast forward ten years, and my wife and I lost a dear friend to cancer. She was a bundle of energy, a great mother, and so young. Thinking of the family that she left behind – 2 girls who at the time were in elementary school – was gripping. And so, as I drove across town today to the funeral of young Shawn Blatzer, I expected that I’d be an emotional wreck. Shawn’s story is perhaps not entirely unique, but all the while, he was unique. Shawn had a rare form of brain cancer – a cancer that most children don’t get. Yes – Shawn was a child. Twelve years old. Thirteen months ago, Shawn received his diagnosis. He and his family were rightfully confused, scared, and upset. Then, he turned his back on the disease and lived life to the fullest. Shawn had an intense love for the Florida Gators. He loved wrestling. He loved God. To say that he and his family are devout Christians is an understatement. Their faith was (and still is) overwhelming. He was so firm in his faith and his understanding and belief that he was saved. Shawn inspired others. Today, as I sat in the pews during the service, I marveled at the stories his youth pastors and his father shared. Funny stories were told. One really got the sense of the man that Shawn had become. God’s man. I found myself shedding tears – but also an intense sense that Shawn was cured of his cancer, and had gone “home”. Shawn was a unique soul, and the world is a lesser place without him. 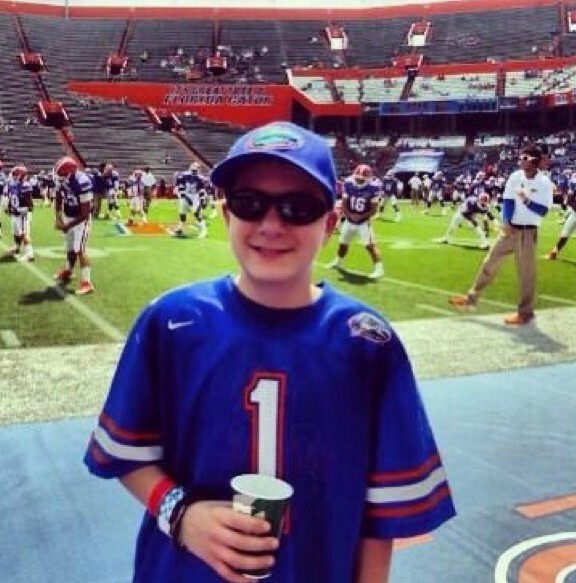 It seems to me, though, that Shawn is likely living it up in the “Gator Nation” corner of heaven. So today wasn’t a joyous day, but a great day. A day to remember. A day to celebrate. No…this isn’t the newest romantic installment from Nicholas Sparks. You won’t find this post full of descriptions of some long lost love, or a daring and dashing guy sweeping some young girl off her feet. Nope. This is a real-life story. A description of breathtaking beauty and a couple of runs that left me completely and utterly breathless. Last month, my family and I took a vacation to Glacier National Park in western Montana. In a word, this trip was AWESOME! We saw some of the most majestic mountains that one can dream of. 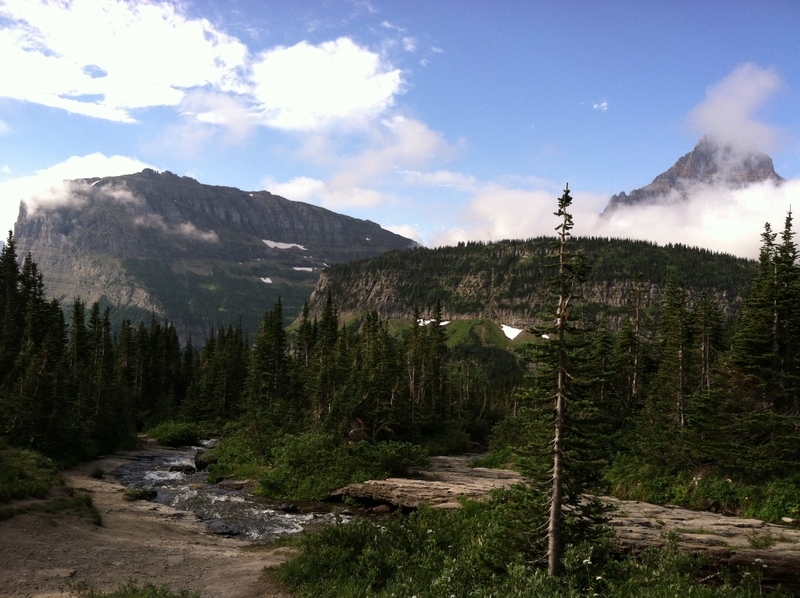 The Going-to-the-Sun road from West Glacier up to Logan Pass is perhaps the most scenic road in the entire country. This 50-mile road transects Glacier National park, and goes up and over the Continental Divide. The sights of big mountains and glacierly carved valleys is awe-inspiring. We enjoyed a week of being outdoors and trying activities that really took us all out of our comfort zone. We learned how to skip rocks. We went horseback riding. We went white water rafting. We challenged ourselves on a high-ropes course. We went zip lining. We hiked to, and touched, a glacier. We saw tons of wildlife – including Grizzly bears, a black bear, elk, bighorn sheep, mountain goats, deer, things that could have passed for meercats (I think they were ground squirrels), and a giant rodent called a marmant. We snacked on wild huckleberries and strawberries. We went to a rodeo (and were BY FAR the preppiest people there). We slept with windows open. We tried some of the most amazing local craft beers (Moose Drool, anyone?). See, my family and I live at sea-level. My house is literally 20 minutes from the Atlantic ocean. Whitefish, MT – the town where we stayed – is at 4500 feet elevation. Our hikes in the National Park took us close to 10,000 feet elevation (up inclines that seemed vertical). Air at this altitude is thin. Especially when you’re used to thick-as-mollasses, humid and salty air where I come from. I found that I was winded at even the slightest level of exertion…like climbing a flight of steps. Imagine what my lungs felt like on a 5.5-mile hike up to Grinnell Glacier that gained about 1600 feet – with the majority of that gain in the last two miles. Perhaps nothing, however, impacted me quite as significantly as going for a run. Way back in ancient history, I used to love running on hills. I grew up in a moderately hilly part of North Carolina, My high-school cross country days were in the piedmont area of North Carolina – over some of the most ancient hills in North America. I went to college in the mountains of North Carolina and did a lot of cycling and running on mountains. I rode the Blue Ridge Parkway frequently. I would climb miles-long mountains. I became a fan of switchbacks and quite rapid descents. Today, I live in a place where the terrain is as flat as your kitchen floor. Hills are man-made in my town. A typical net elevation gain on a long bike ride might be 100 feet, give or take. I’m just no longer used to running up and down. So during vacation, I went on a couple of short runs (one was 3 miles; the other 4), but afterwards I felt as if I’d run a marathon. My legs were trashed. My lungs seared. I recalled quite quickly how easy it is to go really, really fast running down a hill, and how painful it is to even crawl up a moderate hill. One of my runs had a half-mile climb at maybe 9% grade. For me, it was my death march. My pulse quickly approached 180. My breathing became one with Darth Vader’s rattled asthma. I just could. Not. Breathe. Despite the lack of oxygen, both of my runs were totally enjoyable. People in cars were friendly – each waving and smiling (probably thinking I was an idiot). I found a nice trail on my second run. I rounded a corner and came literally face to face with a deer. He stood his ground and didn’t move until I was about 10 feet from him. I saw beautiful mountain flowers and streams. All-in-all, the whole experience was absolutely beautiful, fun, and breathtaking. Listed below are some hyperlinks for information about some of the things we did and where we stayed. If you are considering taking a family trip to the western part of the US, I’d STRONGLY recommend that you consider Montana and Glacier National Park. I know that Yellowstone & Yosemite get a lot of “press”, and are often very, very crowded. We found that Glacier was not crowded, that the people were amazing, and the sights incredible. This particular vacation is amoung one of our top three all-time vacations. 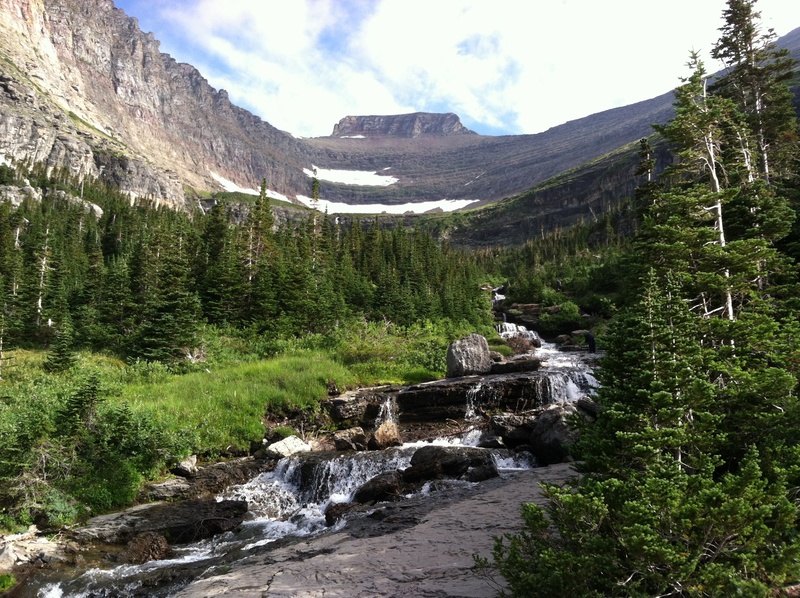 Glacier National Park – National Park Service: This is the official NPS website for Glacier. Tons of information and photos here about the park, how the Going-to-the-Sun road was established, weather, animals you’d see, etc. This is a must-visit website! Whitefish Mountain Resort: We rented a two-bedroom condo at this resort. The condo was perfect – king bed in one bedroom, the 2nd bedroom had a queen bed and two twin-bunks. Perfect for our family of five. The resort has tons of summer activities – this is where we did the high-ropes course, zip lined, and did one of our hikes. We also went on an “alpine slide” – which is basically like a luge course on a skateboard. You can also mountain bike on the mountain (we didn’t). And – if you go to the mountain anytime after October, expect to ski (both alpine and x-country). The folks at the resort said that Whitefish is one of the top ten ski destinations in America – we aren’t skiers, so I can’t vouch for that. Horseback riding in Glacier: We used Swan Mountain Outfitters, and went out of the Lake McDonald Corral. These folks were awesome. The horses were well taken care of and certainly knew their way around a trail. We went on a two-hour ride (which actually became almost a three-hour ride because, well, horses don’t wear watches, and the ride lasts as long as they want it to). Whitewater Rafting: We went on a half-day float with Glacier Raft Company in the town of West Glacier. We floated the Middle Fork of the Flathead River – the rapids were mostly graded category 2 and 3. Our guide was excellent, and the ride was amazing! If you’re a fan of craft beer, there are lots of options – both in local draugh houses and available for purchase in stores. I really liked options from Big Sky Brewing (Moose Drool and Trout Slayer were my favorites), but I also really liked the Nut Brown and Sawtooth offerings from Bitter Root Brewing. We also dined at a couple of brew-pubs, but for the life of me I can’t remember which ones they were. One was in Columbia Falls, MT and I think the other was in Hungry Horse. It could have been in Whitefish. I’m just not sure. Either way – the beer in Montana is GREAT! And – by the way, Big Sky Brewing is a sponsor of professional triathlete Linsey Corbin. If that’s not enough of a reason to drink it, I don’t know what is! Unfortunately, for those of us east of the Mississippi River, you’re not likely to find many of the Montana brews. Word is that they aren’t pasteurized, hence they aren’t shipped that far. Too bad. Without a doubt, you’ve likely seen a tremendous outpouring of support for Boston and the victims of the horrific attack last week. There are so many people who were impacted and injured it’s almost unbelievable. All last week – and even as we headed into this week, local running clubs all over the country (and perhaps world) were holding solidarity runs for Boston. People ran to honor those injured and killed. While each of those impacted certainly is worthy of being honored, I fear that so many of those impacted will have a greater burden to bear. The sheer monetary cost of the crime will be difficult for many to overcome. I can only imagine how staggering the medical bills and costs for ongoing care will be for the most injured. Far too many will incur huge medical bills. Many will be out of work due to their injuries. There has been no shortage of fundraising efforts, either. The One Fund was established as one way to get funds to the victims. Announced earlier this week by Massachusetts Governor Patrick and Boston Mayor Merino, the fund was seeded with a $1,000,000 committment from John Hancock. Closer to home, the triathlon community is stepping up to support victims of the bombing. Rev3 Triathlon announced yesterday that it was partnering with the city of Knoxville and the University of Tennessee Athletic Department and will be donating all proceeds from the Revolution3 Glow Run 5k – which will be held on Friday evening, May 3rd – to help fund the treatment and recovery of a former UT swimmer, Nicole Gross. Nicole was near the finish line with her husband and a friend when the bombs went off. She suffered a catastrophic leg injury – and has had at least seven surgeries already. Her sister was also critically injured. If you’re planning on being in Knoxville for Rev3’s race that weekend, hopefully you’ll consider also running in the Glow Run 5k on Friday night. If you’re not able to race – or aren’t even going to Knoxville for the weekend, please consider making a direct donation to help Nicole with her medical bills. You can contribute directly at www.bestrongstaystrong.net. I’m encouraging you to help support those affected by this tragedy. Please consider supporting Rev3’s efforts to raise money for Nicole. Please make a donation to the One Fund. I know that I’m going to do both.